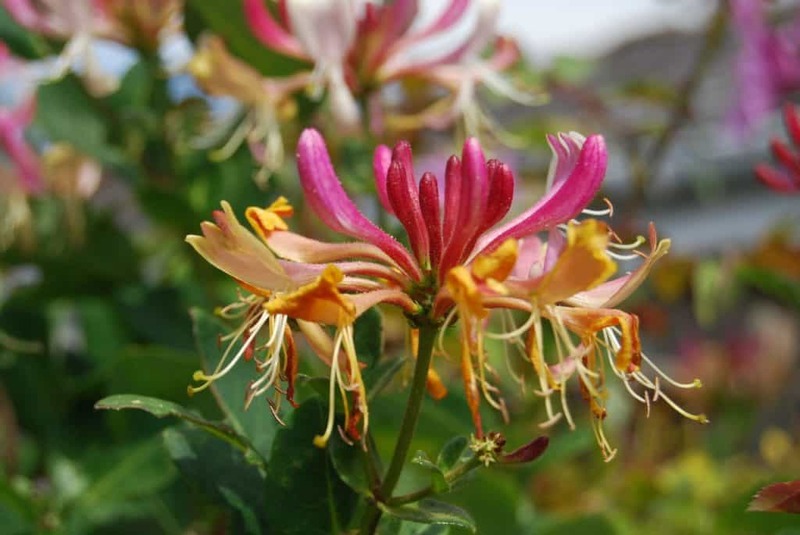 Honeysuckles are a much-loved garden plant valued for their pretty, sweet-scented flowers. The climbing varieties are useful for covering fences, walls and pergolas. There are also shrub varieties. Winter honeysuckle adds colour to the garden at the drabbest time of the year. All varieties will draw abundant wildlife with their numerous scented blossoms. Honeysuckles are easy to grow and thrive in a variety of conditions. This article covers how to choose the right honeysuckle for your requirements, how to care for your plant, and how to overcome any problems that may occur. Winter honeysuckle is an excellent choice for hedges or screens. It also makes a nice container plant in seating areas areas where you can enjoy its lemony fragrance. The creamy-white blossoms open in late winter or early spring. Winter honeysuckle grows to an ultimate height of around 2 metres (6 feet). Sakhalin honeysuckle is a shrub that provides all year interest with flowers of deep red to purple rose followed by ruby red fruit and golden autumn colour. Sakhalin honeysuckle grows to an ultimate height of around 2 metres (6 feet). Lonicera japonica, or Japanese honeysuckle, is a vigorous climber with dark green leaves and white fragrant flowers from spring to summer. Avoid planting Japanese honeysuckle in warm climates as it can become invasive and is considered a weed. This deciduous and vigorous honeysuckle has sweetly fragrant white to yellow flowers in mid to late summer. It also produces abundant red berries in autumn. This deciduous honeysuckle bears scarlet flowers in summer and orange-red berries in autumn. Honeysuckle plants are relatively easy to grow and care for. They do not require any specialised treatment or complicated pruning, making them a no-fuss plant that offers a bounty of colour and scent to the busy gardener. Honeysuckles can be grown in containers, but do make sure they are not allowed to dry out. Be especially mindful through any dry spells in winter. They like their roots to be cool, so choose a nice deep container. Climbing honeysuckles will need some support if they are not just to spread across the ground. A sturdy support or trellis will help them. The plants are also perfectly suited to being grown over a pergola, arbour or arch, beneath which you can enjoy their deliciously perfumed flowers and watch the wildlife that comes to enjoy their nectar. Honeysuckles can be planted in early spring, as soon as any danger of frost has passed. Prepare the soil by digging in some organic matter. Set the plants a minimum of 2 – 3 feet apart and 6″-12″ away from walls, trees or fences. Dig a hole twice the size of the pot and add some potting compost. Plant level with the surrounding soil. Mulch the soil with organic matter to keep the roots moist. In their natural environment honeysuckles grow in woodlands with their roots in the shade and their topmost branches in sunshine. In the garden, the plants can cope with a variety of different situations and soil types. While they do best in full sun, they will tolerate some shade. Their roots need plenty of room to grow deep and stay cool. Water regularly until the root system is well-established. After that, the roots will be able to find enough water except in very dry spells. Container grown plants, or those close to walls or trees will, of course, need regular watering. Honeysuckles can also cope with most soils, though a free draining soil suits them best. Adding organic matter to the soil will help your honeysuckle thrive. When repotting, choose a container that is two to three times larger than the honeysuckle’s current pot to accommodate the plant’s growing root system. If you intend to install a support system within the pot, the container will also need space for this. Fill your pot halfway with compost. Remove the plant from its container carefully to avoid damaging its root system. Place the plant into the new pot so that the base sits just below the lip of the container. Fill in the surrounding space with more compost and press down the soil to make sure there are no air pockets around the roots. Careful insert stakes or a trellis avoiding the roots of the plant. Certain varieties of climbing honeysuckles can spread too much if not controlled. For this reason, you may want to prune your climber to limit its spread. It’s generally best to cut them back in late autumn or winter when the plant is dormant. You can prune an overgrown climber quite heavily without any adverse effects. Your honeysuckle will begin to grow vigorously once more in the spring. Members of the Lonicera periclymenum group flower on new growth, so these should be cut back right after flowering in the mid to late summer. Cutting these back in early spring will result in no flowers that year. There are several ways to propagate honeysuckle. 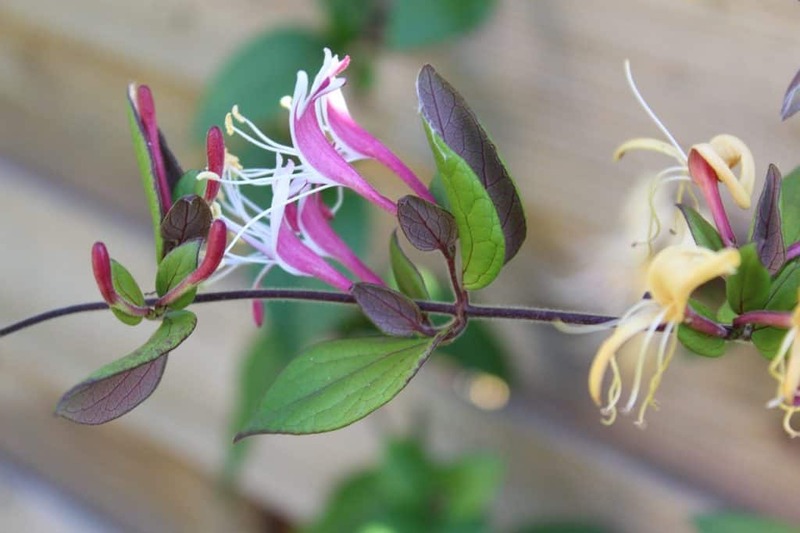 Layering is a very simple way to create a new honeysuckle plant. This is best done in the spring. Simply take a low growing stem and bend it toward the ground. Where the stem touches the ground, scratch the side facing the earth with a knife. Dig a hole where the stem will be planted and add some potting compost. Bury the scratched part of the stem in the hole and cover with potting compost. The stem will now form roots. Keep it lightly watered until it becomes established. Once it starts to send up new shoots, you can dig up the plant and replant it elsewhere if you want to. A second propagation technique for honeysuckle it to take cuttings. Cutting should be taken in late spring or early summer. Take a clean, very sharp pruning knife or a pair of secateurs. Cut off about six inches (15 cm.) from the end of a two-year-old stem at a 45-degree angle. Remove the lower sets of leaves, dip the base of the stem in rooting hormone powder and then place into a pot of damp potting compost. Keep the pot moist. Within a few weeks, the roots should be established and you can replant in a pot or in the ground. You can also propagate honeysuckles by seed. You can sow your own seeds saved from the plants you have or those of a friend. Alternatively, they are widely available to buy. The seeds need cold in order to germinate, so it’s best to sow them in late autumn. Honeysuckles are bothered by few pests or diseases. Most of these are caused by adverse growing conditions. The new shoots of honeysuckle are prone to aphid attack, which can cause the leaves to become yellow and curled. Left untreated, the infested stems will die off. Check any curled leaves for signs of aphids. Pick these off or spray vigorously with water to dislodge them. A severe infestation may need to be treated with an insecticide. Honeysuckle is prone to powdery mildew infections. This shows as leaves covered with a fine white powder. Badly infected leaves become discoloured, misshapen, and finally drop off. Powdery mildew is caused by fungi and can occur in either hot, dry weather or very humid conditions. Powdery mildew occurs more often with plants grown closely together as this increases humidity. If the plant is grown close to a wall or near trees this can prevent its roots from growing deep enough to get adequate water. Q How can I encourage my honeysuckle to grow more flowers? Honeysuckles do need plenty of sun to flower profusely. Try moving your plant to a sunnier position or cut back other plants that are casting too much shade. Over-fertilizing with a high nitrogen fertilizer will also result in lots of lush green leaves but few flowers. Pruning at the wrong time of year can also cause your plant not to flower that season. Q My honeysuckle’s leaves are turning yellow. What’s causing this? Yellowing of leaves can be a result of overwatering. This is a particular common problem in honeysuckles that are grown in containers, with not enough drainage. It’s also worth checking the leaves for pests such as aphids and removing these by hand or with a jet of water. Lastly, leaf scorch can cause yellow and brown patches on leaves. Try to move your honeysuckle out of very strong sunlight to prevent this. Ideally, your plant should be in good light but with its base sheltered from strong, drying sunlight. It likes to be kept moist but not waterlogged. Q My honeysuckle is losing its lower leaves. Why is this? Honeysuckles do sometimes lose their lower leaves as they age. They are a woodland plant, so put most of their energy into the areas that are high up in the sunlight. You could try growing something else in front of your climber to cover up the bare stems. If your plant is in a container, leaf loss might indicate that it needs repotting into a larger container. Q My honeysuckle has died over winter. What did I do wrong? It’s possible that your honeysuckle wasn’t hardy enough to cope with winter temperatures. When choosing your next plant, pick a hardy variety that can resist frost and freezing temperatures. Alternatively, if the weather in your area has been very dry this may have been the cause of your plant’s demise. Honeysuckles may need extra watering in periods of dry weather, even over winter. This is especially the case when the plant is in a container. Q My container grown honeysuckle always looks sickly what can I do? Honeysuckles can survive in containers, however, they generally do better in the ground. This gives their roots plenty of room and allows them to keep cool and moist. If possible, you should plant your climber in a place where it will get plenty of light, but not get too hot at the roots. If this isn’t possible I would suggest planting it in a nice big container.